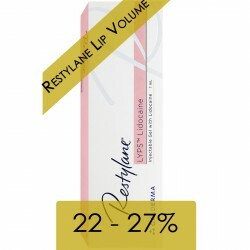 Restylane® Volyme Lidocaine (1x1ml) - Aesthetic Pharma Sp. z o.o. Non-animal cross-linked hyaluronic acid. The main component of Restylane® (before: Emervel®) is hyaluronic acid. This is a naturally occurring substance found in all living organisms. The hyaluronic acid is mixed with a cross-linker called Butanediol Diglycidyl Ether (BDDE) to form a gel, which is then purified through dialysis to remove trace amounts of BDDE left over from the process. The hyaluronic acid in Restylane® is produced by a biotechnological process from bacterial fermentation without using any animal products. Restylane® benefits from what the manufacturers call its Optimal Balance Technology™. Restylane® has 4 levels of cross-linking, resulting in 4 levels of gel firmness across the range. Particle size or calibration is achieved during the manufacturing process after cross-linking, by sieving the gels through different sizes of mesh. Restylane® Volyme (Emervel® Volume) also has a very high volume lifting effect and integrates with the skin matrix to address lost facial volume associated with ageing. It is suited to patients wishing to enhance or recontour their facial features such as the cheekbones, cheeks, chin, or the whole facial oval. The addition of 0.3% lidocaine ensures comfort during treatment. The Optimal Balance Technology™, employed in the manufacture of Restylane®, provides a product which lasts for 6 - 9 months. In clinical trials, some effects have also been seen at 12 months. Restylane® Volyme is the solution for enhancing and restoring lost facial volume to areas such as your cheeks, chin or jaw line. 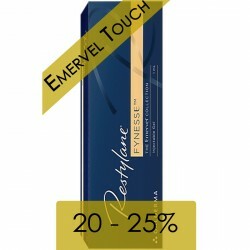 Emervel Volume restores and adds support to the skin’s structure giving a smoother, fuller and more yourthful appearance. needles: 2 x 27G 1 "ultra thin wall"